Periodontal disease (also called gum disease and periodontitis) is the leading cause of tooth loss in the developed world, and is completely preventable in the vast majority of cases. Professional cleanings twice a year combined with daily self-cleaning can remove a high percentage of disease-causing bacteria and plaque. There are numerous types of oral hygiene aids on the market shelves, and it can be difficult to determine which will provide the best benefit to your teeth. Dental floss is the most common interdental and subgingival (below the gum) cleaner and comes in a variety of types and flavors. The floss itself is made from either thin nylon filaments or polyethylene ribbons, and is excellent in removing food particles and plaque from between the teeth. Flossing with a floss holder can be a good alternative. Floss should normally be used once daily . Oral irrigators, like Waterpiks have been created to clean debris from below the gum line. Water is continuously sprayed from tiny jets into the gum pockets which helps remove harmful bacteria and food particles. Overall, oral irrigators have proven effective in lowering the risk of gum disease and can be used instead of flossing. Tongue cleaners are special devices which have been designed to remove the buildup of bacteria, fungi and food debris from the tongue surface. The fungi and bacteria that colonize on the tongue have been related to halitosis (bad breath) and a great many systemic diseases like diabetes, heart disease, respiratory disease and stroke. Tongue cleaners can be made from metal, wood or plastic. There are a great many toothbrush types available. Electric toothbrushes are higly recommended by dentists because electric brushes are much more effective than manual brushes. 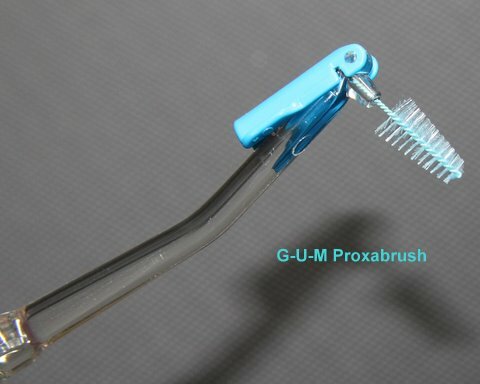 The rotary motion helps to easily dislodge plaque and remove food particles from around the gums and teeth. The same results can be obtained using a manual brush, but much more effort and time is needed to do so. Manual toothbrushes should be replaced every three months because worn bristles become ineffective over time. Soft bristle toothbrushes are far less damaging to gum tissue than the medium and hard bristle varieties. In addition, an appropriate sized ADA approved toothbrush should be chosen to allow proper cleaning to all the teeth. Teeth should be brushed after each meal, or minimally twice each day.